….for soup! Once upon a time the only soup I knew of came in a can. We made the transition to BPA cans, and well, that got expensive. For just a moment, a bit about BPA cans. THEIR BAD FOR OUR BODIES! “What does BPA do to the human body? BPA can also be found in epoxy resins which is used as coatings inside food and drinks cans. Bisphenol A is an endocrine disruptor – a substance which interferes with the production, secretion, transport, action, function and elimination of natural hormones. What are the side effects of BPA? impaired, altered, and compromised immune system and functions. You can do your own investigating to all the studies as to whether exposure to BPA does or does not cause cancer in humans, while I continue to be a skeptic and get to making some soup. With this being our third winter of soup making, I am now being presented with requests from kids “this one next”. *it doesn’t take a lot of time, money or creativity. With the request of broccoli soup from my “I don’t eat soup” teenager, I went to the internet. This request was actually submitted a month ago. I purchased 3 giant heads of broccoli intended for the soup pot, that ended up in the compost. Is it just me or can you not find that the internet can be so darn overwhelming! All we needed was a simple broccoli soup recipe, not a fancy just like so-and-so, Mr or Ms Gourmet Chef, fancy restaurant, or worse out of the can sort! In acting like how I occasionally do when things appear just too complicated, I do nothing. Hence the gone bad broccoli. With the intention for simplicity I closed the internet and found exactly what I needed a old Betty Crocker Cookbook. Getting in the kitchen is a safe space to get out of your comfort zone. So, let’s get started, if I can do it so can you! You need a big pot, or start off small if you won’t be making enough to freeze. *chicken or beef bones – our local market sells a bag of chicken bones for $2.00. Post Thanksgiving and Christmas turkeys can be double wrapped in a bag and stashed in the freezer until you get to making broth. Add all of these to the pot, then fill with water. Put it on to boil, then reduce to a slow simmer for at least 4 or 5 hours. Keep the lid on to reduce evaporation. Now, if all you have time for is this, then get this far, turn off the stove and leave it until later or even the next day. What you need to do now is separate everything in you pot from the liquid. I easiest thing and by far the best, is a fine mesh strainer. It not only will get to the very bottom of the pot but it will take out every little piece of bone. I’m sure you can get it from and household/kitchen supply store. Mine was gifted to me after spending a morning learning how to make PHO from a restaurant owner. This now is your basic broth. You can measure it out and freeze like this, you can dilute it for a nice comforting nutritious hot coffee replacement drink, or lets get to making soup. If you want to make a chicken noodle soup, dig through what you strained out for pieces of meat to add back. 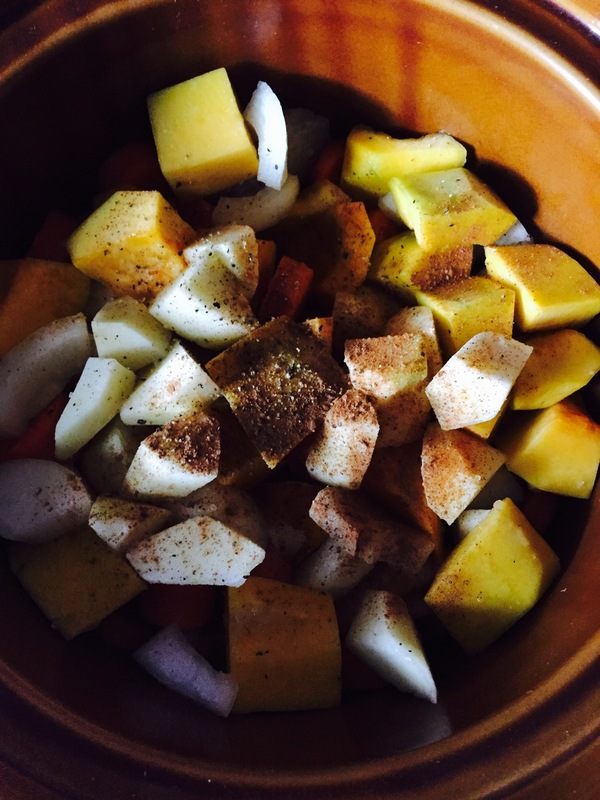 There area no rules with what you put it as long as their cut in uniform size; potatoes, yams, carrots, celery, peas, small pasta, rice…..what ever you like. Split Pea: I didn’t use a ham bone OR soak my peas overnight. Saute celery and onions in butter until transparent-how ever many you like and how much your making. Add 6 cups stock to pot, (I may have added a cup or two of water as well), 2 cups dried green split peas. Bring to a boil then reduce to simmer while covered for a couple of hours. The peas will get soft and mushy. Once everything is tender turn off the stove and in using a hand held mixer blend it all-aka, the hide the onions part. Ok now your going to make the add in cheese sauce. In another pot melt 45 ml of butter. Turn off the stove and add 45 ml flour, making a paste. Slowly add 2 cups of water, while stirring. Turn the stove on to heat this slowly, while stirring. It will thicken. *IF you are making a super size pot of soup, be aware that you will need to double or triple this part* Once it thickens, add the grated cheese; stirring until it melts. Melted? Great, add it to the soup. This is where I added the cup or two of broccoli florets I set aside earlier. And…..that’s…….it. My kid(s) loves it. I’m happy that she is now a soup eater. We’ve actually taken a side track (squirrel) to butternut squash soup. In trying some facebook recipes, we’ve had more misses than hits. 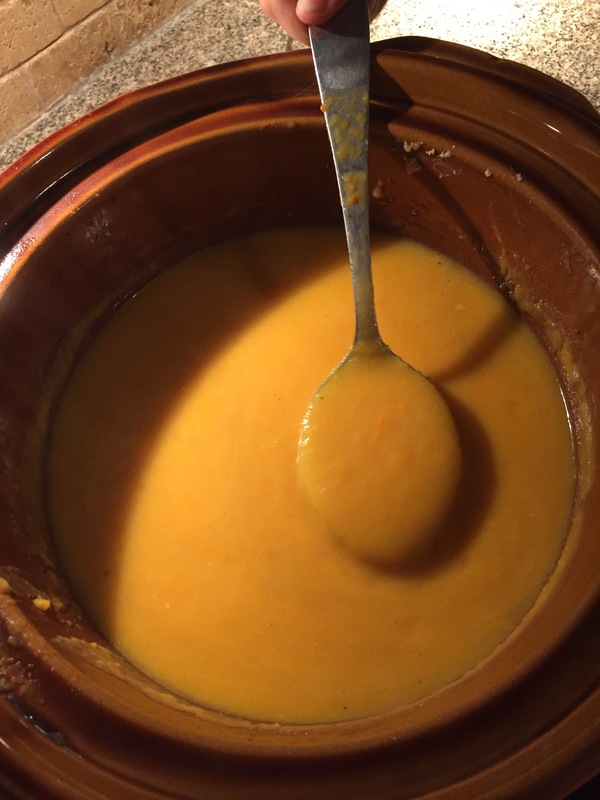 With thousands of hits and the plethora of root veggies available, this one (http://www.gimmesomeoven.com/slow-cooker-butternut-squash-soup-recipe/) was next. I really like the coconut milk in it.